Busy Bea has been brought in to fix Blunderton’s stadiums! After being named the “Worst sports town of the year,” the citizens of Blunderton are in a dire situation. Use Beatrice’s talents and get the city out of a sticky mess in this fun and exciting Time Management game! Busy Bea’s Halftime Hustle will have you cheering for the home team in no time as you dash through multiple minigames and unlock upgrades. Busy Bea's Halftime Hustle is rated 4.4 out of 5 by 14. Rated 5 out of 5 by SumrBrz33 from Such a fun game! Love this game! It's a lot of fun. and can be very challenging! Rated 5 out of 5 by rlambert from A great game With this game, I keep going back and playing over and over. Glad I bought this one. Fun story and love that it has expert levels to try to beat also. Rated 5 out of 5 by missmary333 from This is a fun game. I always enjoy a good TM game. Interesting story line and challenging enough to keep your interest. Bought this with no regrets. Would love to see more TM games. Rated 5 out of 5 by catbag8717 from Absolutely Loved It!! I absolutely loved this game! Good Parts: Very simillar to Megaplex Madness, so the controls were no problem. A brilliant storyline that progressed as the game went on Just like Megaplex Madness, this game was addictive fro the start. Before I knew it, my free trial was gone. Unlike Megaplex Madness, playing with 3 colours was no problem. I could easily et 3 of each thing. The arcade games were really fun. I loved each one of them! You could pay with gold coins this time. Good graphics. The added challenge of having the mayor at the end of each set of each levels. Being able to use Bea as a server. OK Parts: The voice-overs did annoy me a little. But it was not bad enough to bring down the rating. Bad Parts: Everything seemed to break down all the time, so it took up a lot of time. I loved absolutely everyhting about this game, so I guarentee you will too. Rated 5 out of 5 by rockfoley79 from Tons of fun!!! I loved it!! Hours of fun!!!!! Rated 5 out of 5 by WolfieD from A game that will keep you entertained for hours! This game is a good mix of time management and puzzle. You have to manage customers at the food and drinks stalls during half-time, by making sure they've gotten their snacks and get back to their seats before half-time's over. There is a lot to do, with you the player being in charge of where the customers are going, while also controlling Bea's actions. 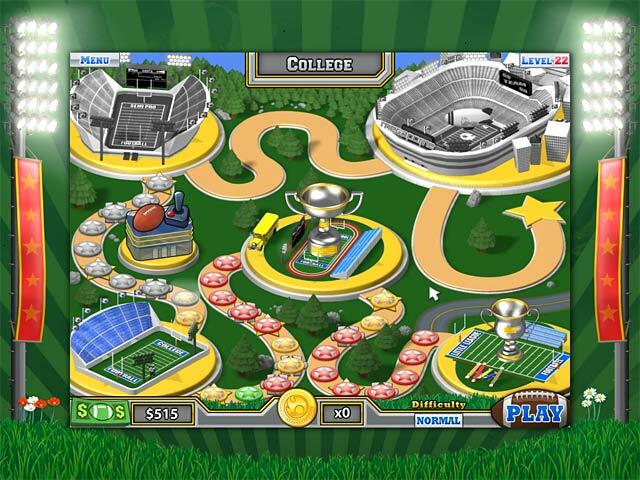 There are also mini-games you can play to gain more money to buy upgrades for your stadium. 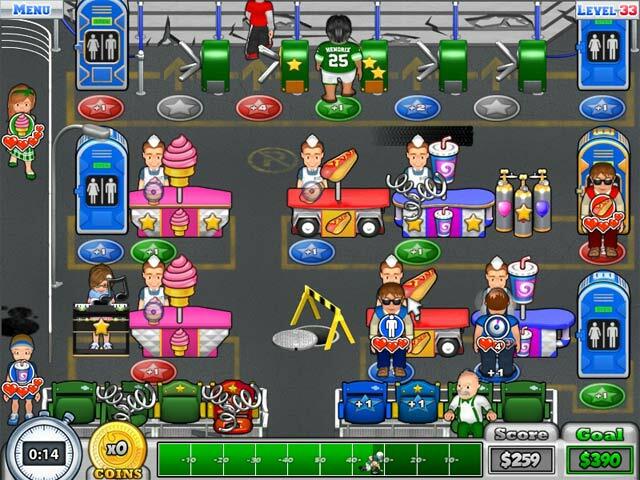 These mini-games bring you back to the old arcade games, such as dodging and jumping over items, or kicking a football as far as you can, and bouncing the football on your head for as long as you can. Overall, a very entertaining game with a lot of re-playability. Rated 4 out of 5 by Jeana_Lowes from Not too shabby. This one is a pretty standard time management game that has enough upgrades to keep a person interested for a long while. Sometimes I find the number of things going on and the intense pacing a bit annoying, if I'm going to be completely honest. But there are some interesting strategy quirks to combat some of the aforementioned pacing issues and the story is less of an entrepreneurial tycoon taking over the old management's place vibe than a more interesting mystery to be tackled vibe. It's different, though in the same vein as Burger Shop or Cake Shop. Rated 4 out of 5 by 5micky from Simply Fun Storyline starts out interesting, but doesn't really have an end or reason as to why the Mayor is working against Bea. Story doesn't resolve, but game play is fun and challenging. Wished for more levels and special prizes/stars for repairing scenes completely. 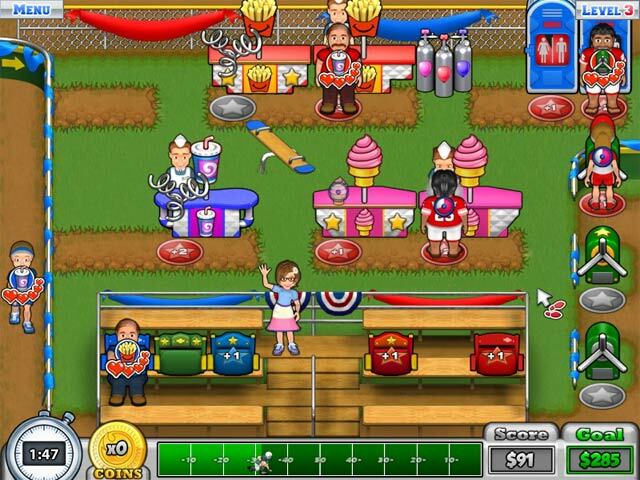 Rated 4 out of 5 by melantha5 from Megaplex Madness meets football This game has the mechanics of Megaplex Madness with a football theme. There's enough that is different and unique about the game - Bea catching footballs or entertaining to keep the patience of fans - to give it a different feel. Like the MM games, there are minigames that earn you extra coins for upgrades and even these are different and kind of fun. Overall, I think it's a fun - and uniquely themed - game. If you like the Megaplex Madness games, it's definitely worth a try! Busy Bea has been brought in to fix Blunderton’s stadiums! Help out the sports fans in this fun Time Management game!